After some research I have found similar peaces in several museums in Europe. I have decided to create a similar piece. 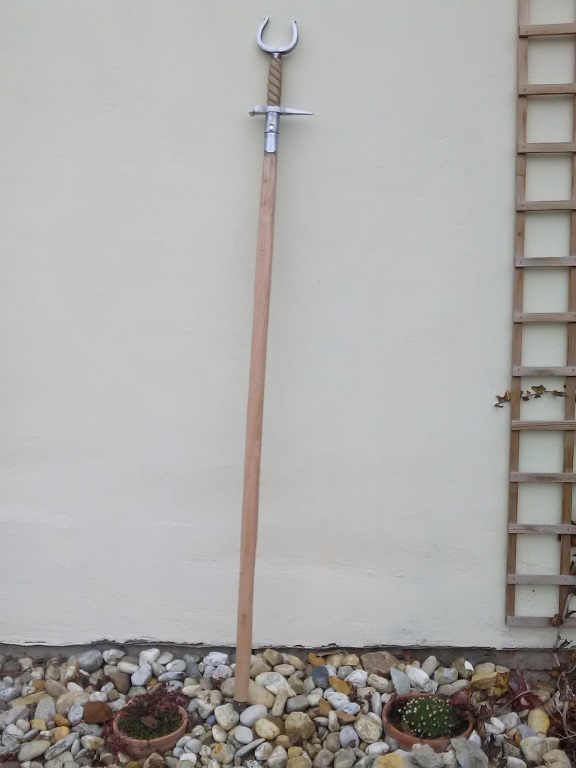 The hammer had was made from an old pick axe that I´ve found in the ground when we were re-cultivating the garden. First I have shaped it with angle grinder, adding some details with files. The hole was drilled and enlarged with files - it was quite a tedious work, because the steel was unexpectedly tough. 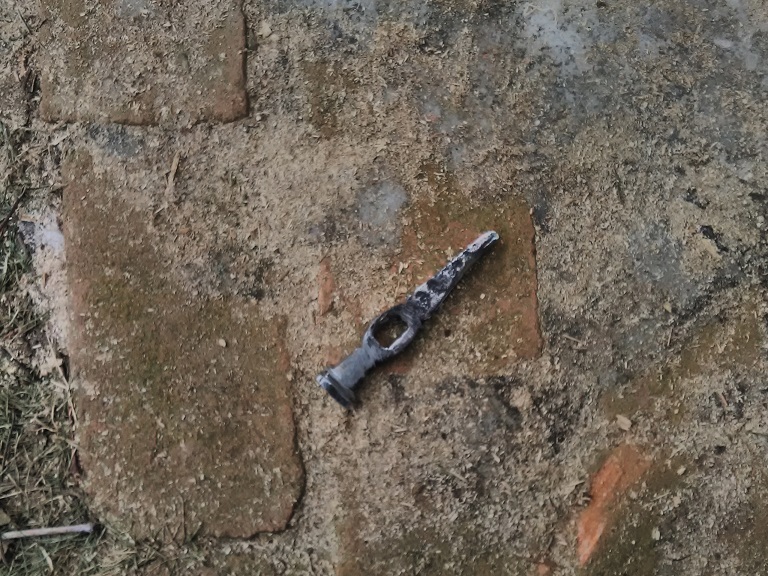 The first picture shows hammer head with what remained from the pick axe. Second picture shows the other side. 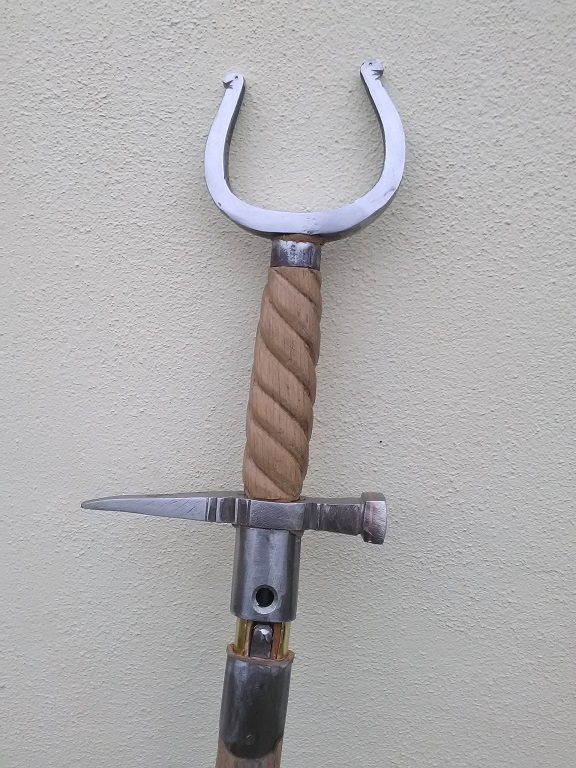 I remember having seen a rapier/musket rest combination in the Musée de l'Armée in Paris. Pretty bizarre weapon! I'm impatient to see your version of this triple weapon in one! Some updates on this project. I have enlarged the socket a bit and cleaned the hammer head. To give it some bling, I´ve made a simple copper inlay round the flat side (picture 1). 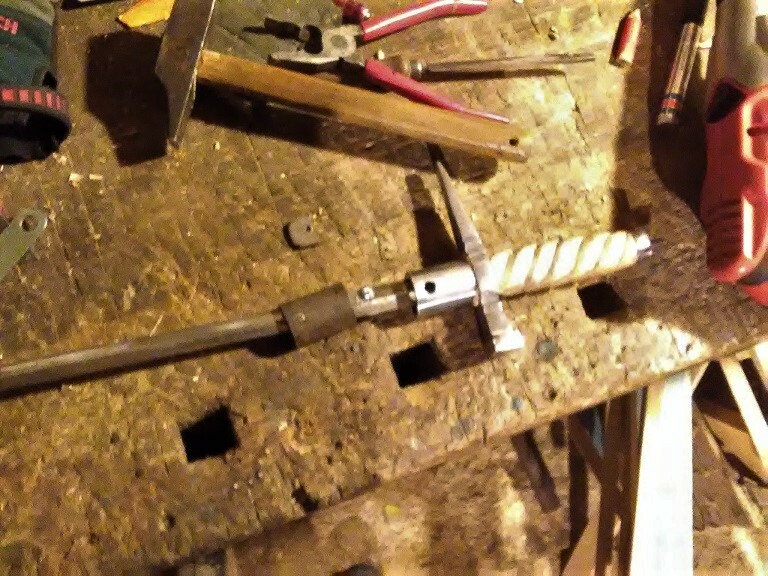 Those little holes are for rivets that will attach a collar, which will hold together the hammer/rapier with the haft/handle of the musket rest. 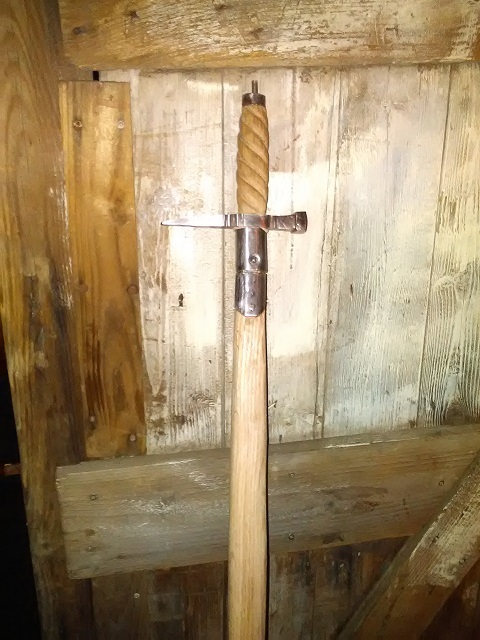 The upper grip was made from a piece of oak wood, reinforced with an iron cup made from some old tube. A first assembly is on picture 2. 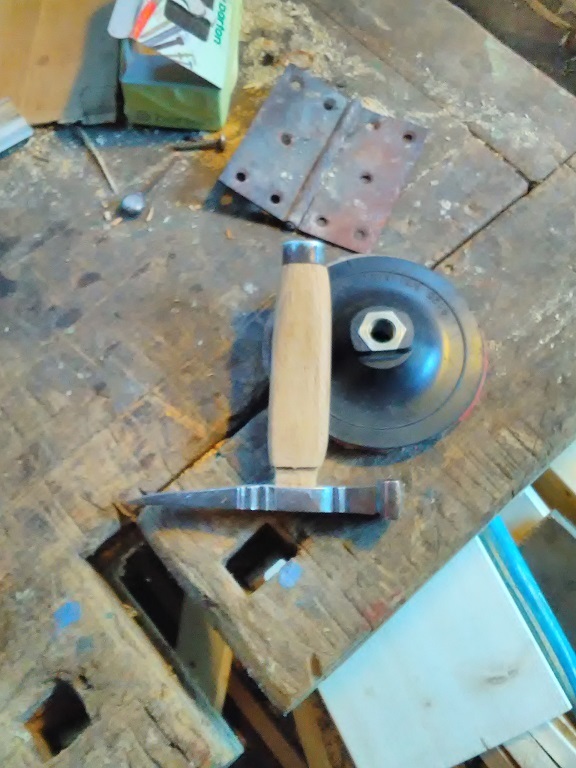 Next I´ve made a collar - an old tube again flatted, cut and filed, with two integral rivets for attaching it to the hammer head. (picture 3). Picture 4 shows it assembled together. 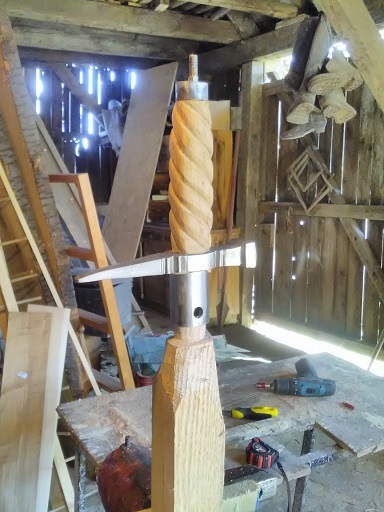 That hole in the side will receive a spring mechanism that will secure the hammer/rapier on the haft. 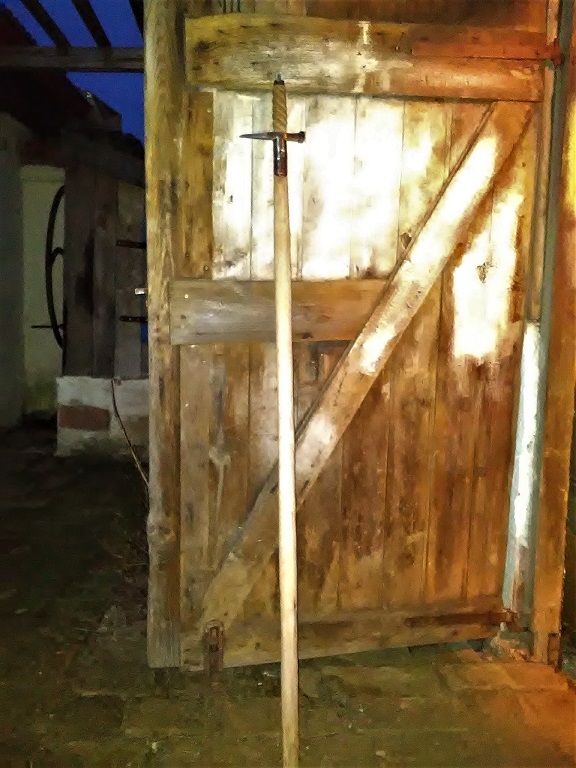 And the last picture shows it mounted on a blade (I´m using an old rapier blade, thin but sturdy, that was bought some years back from a friend of mine - I knew I will put it to some use:)). As you can see, I have carved the grip, now it feels much better and safer in hand. Thank you, Mark. I have made a plain grip first, but did not like to so much, so I have replaced it with this one. There´s a little update: I´ve made a spring mechanism that will hold both parts together. 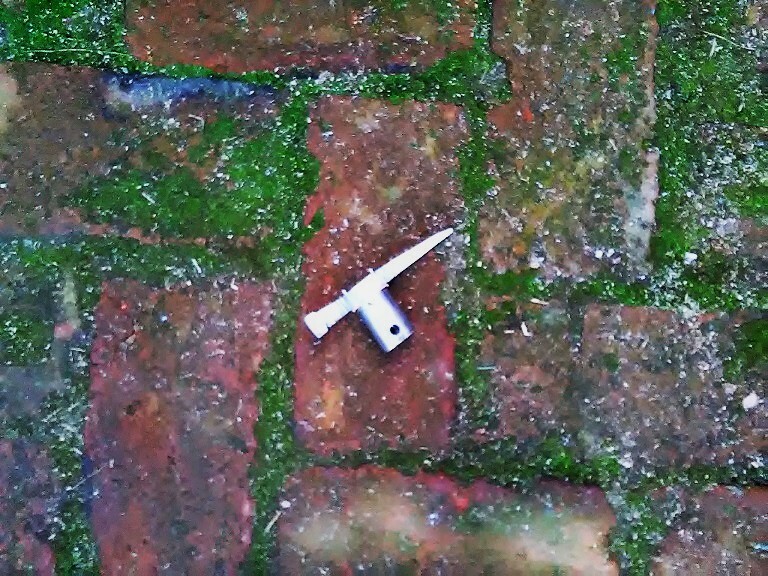 It´s extremely simple: just a spring with a button, which will click into a hole in the collar, under the hammer head. Now I need to find some suitable material for the haft. I have no clue how it was made on original pieces (did they drill / burn a hole for a blade?) but I will probably make it from two (preferably oak) slabs, chiselling the core, gluing them and shaping to oval cross section. Let´s see how that´d work. The project is nearly complete. The haft was made from an oak wood - two halves carved and glued together (pic 1). 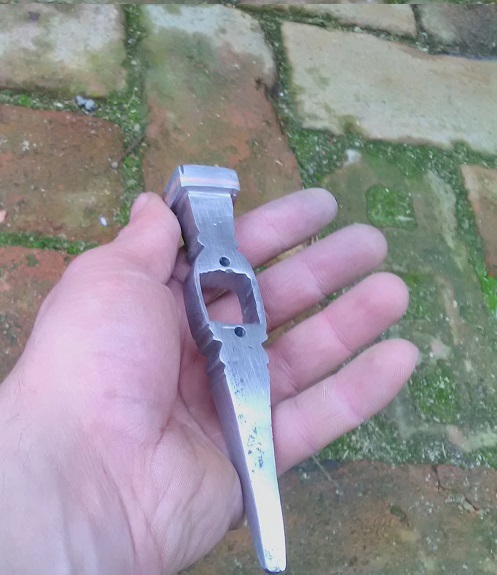 Using an angle grinder and a rasp, I have first shaped the upper part (pic. 2), then the rest. It took me some 3-4 hours. 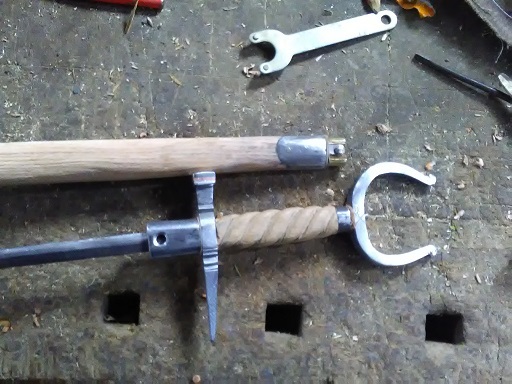 Next two pictures show the completed piece, and a detail of the hammer head. 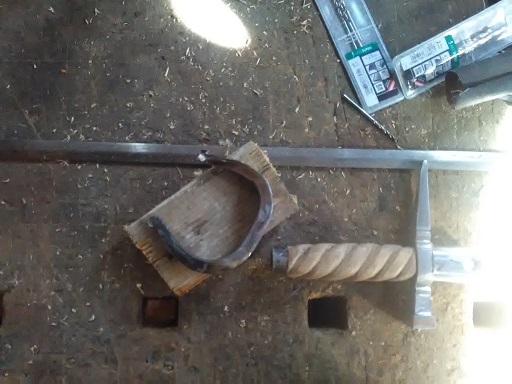 Now I will make a fork-rest, and finish the haft, and metal pieces, with sand paper. Hi Mark, thanks. Sure, I do. 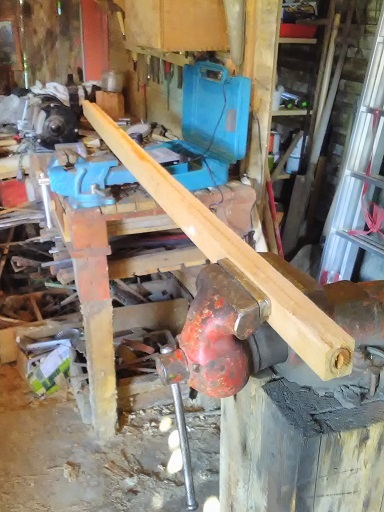 I´ve made some myself http://myArmoury.com/talk/viewtopic.php?t=303...mp;start=0 but this one is going to be used with an early-type snaphance musket I´d bought a year back, once the project is finished. The forked rest was made from a piece of steel 20*2*1 cm (picture 1). I had to make it quite massive to make the "rapier" well-balanced. I have shaped it with angle-grinder, and then bent it in a vice (pic 2). After some more shaping, cleaning and drilling a tang-hole, the piece was ready for the final assembly (picture 3). 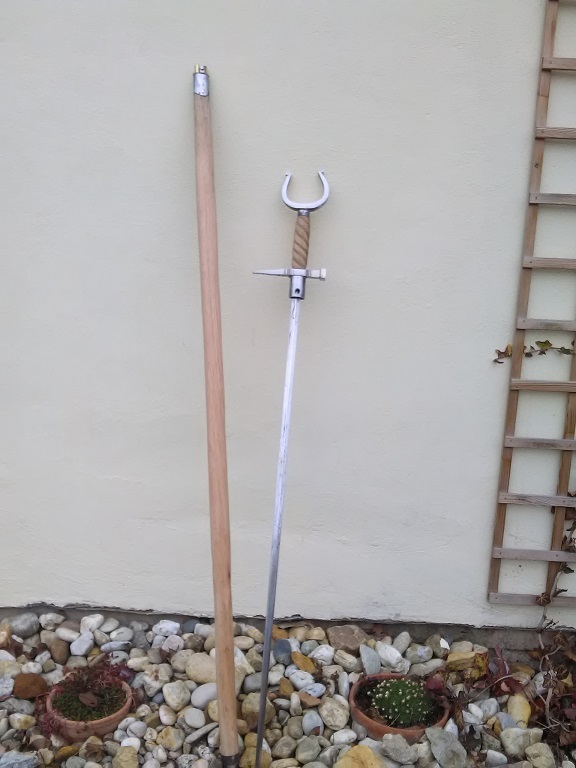 Here are some pictures of the finished musket-rest/hammer/rapier. 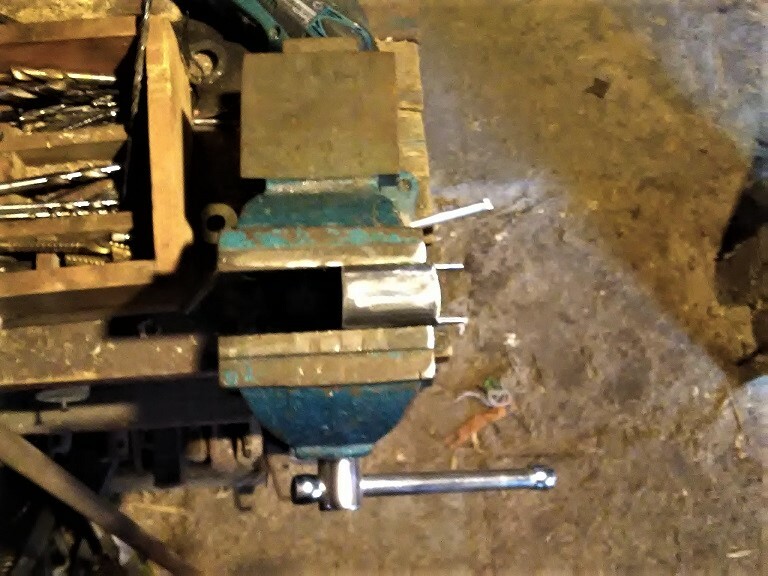 The spring mechanism is little stiff, but at least I do not have to worry when swinging the hammer around. Rapier is quite well-balanced, with the POB some 3 cm from the "guard" - it allows sufficiently good control over the point. 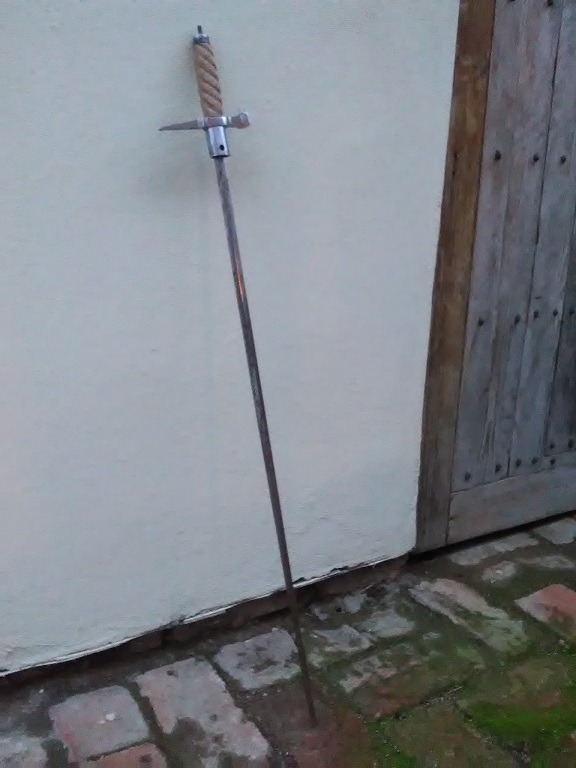 In fact, from my experience, 3cm from guard is not close to the average historical rapier PoB. 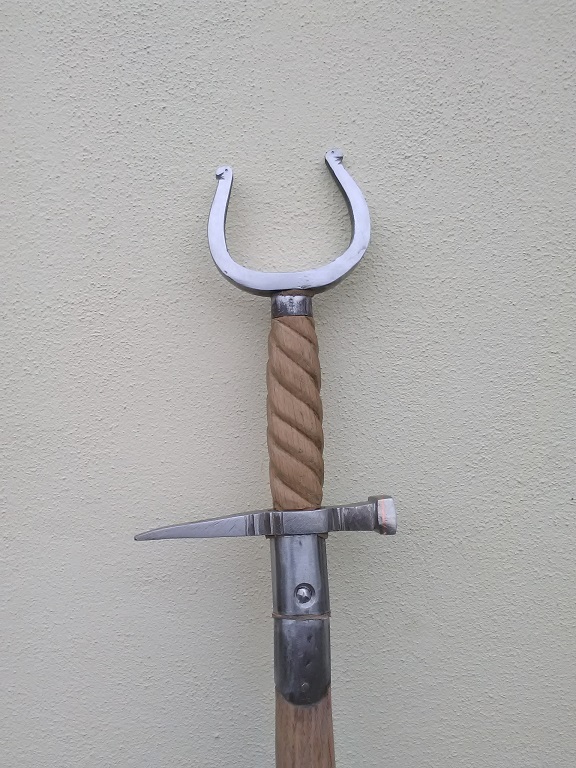 The average that I found, with a sample of about 30 to 40 historical rapiers was about 10 to 15cm from crossguard, depending to the blade length (average 12,5cm, with a standard deviation of 3cm). 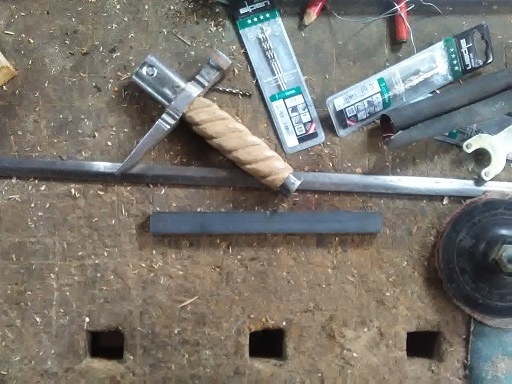 In terms of proportions, the PoB is at about 1/9th of the blade length. However, in your case it can be interesting to get a PoB closer to guard, to have more power in your hammer strikes. Every situation has its pros and cons. That's quite a nice piece anywway, congrats!